-Footage aired from the previous episode of Heath Slater capturing the FCW Heavyweight Championship. At ringside, announcers Byron Saxton & Dusty Rhodes revealed that Slater would defend the title against former champion Tyler Reks. Rhodes called it the biggest title match "in quite a few weeks." Espiral is the masked luchador better known as Sicodelico, Jr. Espiral is seeking revenge for his friend after Escobar used underhanded tactics to defeat Alberto Banderas (Dos Caras, Jr.) last week. Escobar works a headlock early and then an abdominal stretch later in the match. Escobar grows frustrated and stomps a mud hole in Espiral. Espiral rolls out of the way of an elbow from the second rope and hits a bulldog for a nearfall. Espiral leaps off the second rope, but Escobar drops him right across his knee. Escobar follows up with the Puerto Rican necktie for the win. WINNER: Eric Escobar in 4:43. Nothing resembling a memorable match. Espiral has since been released from WWE developmental. -After the match, Escobar choked Espiral with a steel chair until Alberto Banderas made the save. McGuirk is an Oklahoma native who is the grandson of promoter Leroy McGuirk and the son of former WWE announcer Mike McGuirk. Cottonwood, real name Kipp Christianson, is a legit 7-foot big man with a background in basketball including playing in the CBA, NBA Developmental League, China, and Lithuania. He is also a Wisconsin native, so I feel obligated to cheer for this man. Cottonwood was announced as recently being reintroduced to society from Kellogs Sanitarium. Cottonwood tosses McGuirk around and then hits a nasty big boot. Cottonwood lifts him up and hits a huge choke slam for the easy victory. WINNER: Eli Cottonwood in 1:00. Too short of a match to judge much of anything, but I don't believe we have another Giant Gonzalez on our hands. -General Manager Abraham Washington came to the ring accompanied by Rosa Mendes and an unnamed Diva (I believe she used to be The Candy Girl with Sweet Papi Sanchez). Washington previewed the Reks/Slater match that will take place later in the show before bringing out Tyler Reks. Both men mocked one another's hairstyles. As a thank you for booking a title rematch, Washington wanted Reks to get down and kiss his shoes. Reks said that wasn't necessary as he had a rematch clause in his contract. Washington asked for a handshake instead. They shook hands and Reks left the ring. Eli Cottonwood walked out and choke slammed Reks on the floor. Washington calmed Cottonwood down to end the segment. Jackman/Chase are members of Abraham Washington's cabinet. Before the match, Chase cut a promo talking about the cabinet going after the tag titles. 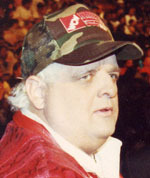 You might recognize Rosser as Fred Sampson from various New Jersey indy promotions. Rosser takes down Chase with a series of shoulder blocks and then catches him in a midair power slam much like Rick Steiner. All of a sudden the screen went to static and changed over to degraded black and white footage. A man we never saw with a distorted voice was holding the camera and talking to Michael Tarver. The mystery man asked Tarver if he was used to being held back by the FCW system. Tarver agreed and started complaining about all the pretty boys that get pushed in FCW. We quickly cut to static again before going back to the match. The heel duo isolates Rosser for an extended period. Prime gets the hot tag and dominates the action. Jackman manages to sneak up behind prime and hit a full nelson slam for the win. WINNERS: Troy Jackman & Fletcher Chase in 6:22. Average match. Rosser shined with some crisp offense early on. Tarver's video that interrupted the match was well done. It's worth noting that the announcers never mentioned the interruption. -Heath Slater made his entrance for the main event. An injured Tyler Reks, complete with bandages around his ribs, followed with referees and Joe Hennig helping him after being attacked by Cottonwood earlier. Slater mocked Reks and then challenged Hennig to fight instead. Hennig ran into the ring and attacked Slater to start. Hennig with a running dropkick for a nearfall. Slater counters a HennigPlex attempt and drops Hennig into the ropes. On a side note, this is the first match where Slater is not wearing a cast on his arm. Hennig sends Slater to the floor and then leaps off the apron with a flying clothesline. Slater is targeting the midsection of Hennig with stomps, punches, and knee drops. Hennig battles out of a headlock and gets a rolling neck snap for another nearfall. Slater scores with a slingshot into the corner for a nearfall of his own. Hennig lands a picture perfect belly to belly suplex before Slater surprises him with a flapjack maneuver. Slater jumps off the second rope looking for a knee drop, but Hennig rolls out of the way. Hennig follows up with the HennigPlex, but Slater somehow managers to kick out. Slater hits Sweetness out of nowhere, but Hennig also kicks out. Hennig small packages Slater and rolls into another HennigPlex seamlessly for the win. Winner: Joe Hennig in 10:10 of what aired. Decent match with a spectacular finish. -After the match, Hennig celebrated with the title. General Manger Abraham Washington came out and informed Hennig that this was a non-title contest since he never signed a contract for a title match. With Hennig distracted, Slater hits him with the title from behind. -Next episode: Serena Mancini challenges Queen of FCW – Angela for the crown and the duo of Jackman/Chase take on the Rotundo Brothers.